Hansjörg Auer on the summit of Lapghar Sar West, 11:30 am, July 8, 2018. Photo: Hansjörg Auer. 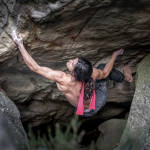 The steely nerves and cool, calm temperament on display in the video are some of the qualities that have allowed Auer to become one of the preeminent free soloists of the current era. 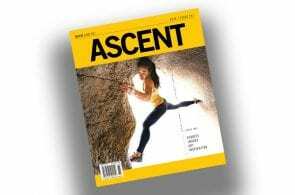 Beyond Alex Honnold’s free solos in Yosemite, Auer’s 2007 ropless ascent of Via Attraverso il Pesce (The Fish Route)—an 850-meter 7b+ (5.12c), on the Marmolada, in Italy—is arguably the hardest ever big-wall free-solo. But unlike Honnold, Auer’s soloing exploits and prowess run the gamut from rock to ice, from big wall to big mountain. 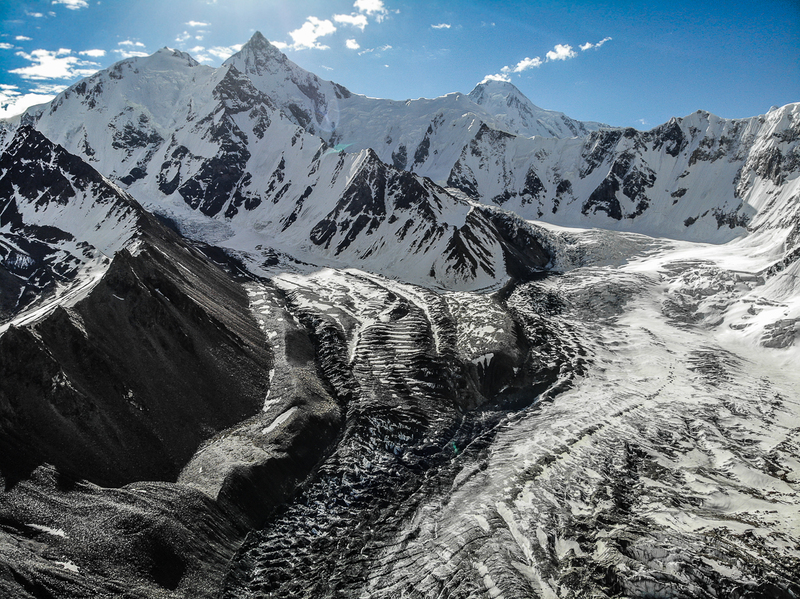 In June of this year, Auer traveled to Pakistan to attempt one of his most intriguing projects yet: a solo first ascent of Lupghar Sar West, a rarely climbed, remote 7,157-meter peak. On July 8, he succeeded. 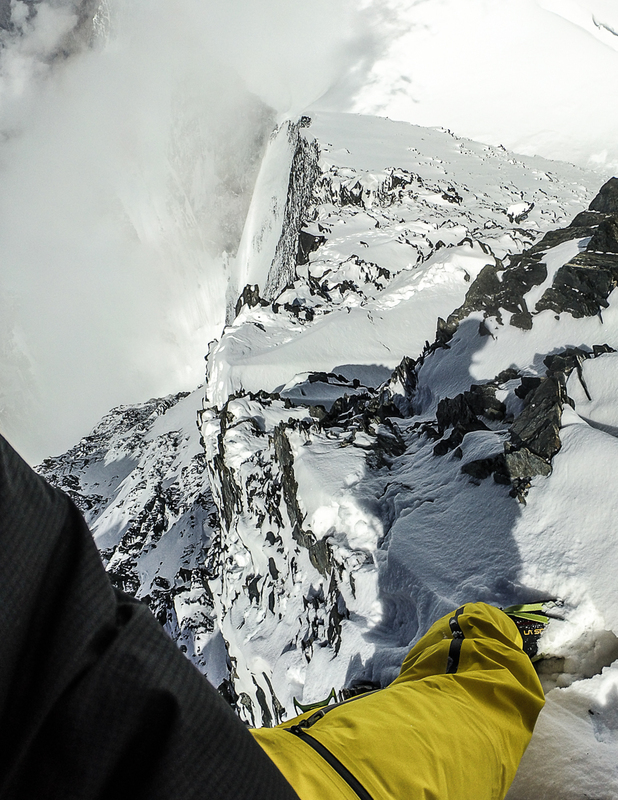 Rock and Ice caught up with Auer to learn what his journey was like and what drives him to undertake such daring solo adventures. How did you first learn of Lupghar Sar? Has it been on your radar for a while? 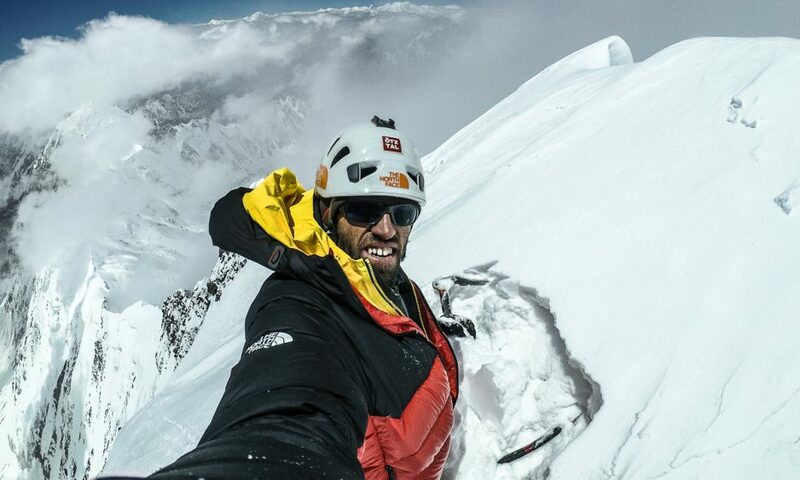 After I climbed the southwest Face of Kunyang Chhish East in 2013 with my brother Matthias and Simon Anthamatten, I checked out many peaks in lower and upper Hunza Valley, because I fell a bit in love with that place. I’m more attracted by mountains with less climbing activity rather than regular visited areas, even if you’re sometimes not getting exactly what you want. But that makes it more exciting. It has been on my radar since 2014. I nearly went there in 2015 but then I decided to keep this project for a solo mission at a later time.The right moment finally arrived this year. What about it made it seem like a good possibility for a solo? Actually, the west face is not that high. It varies from 1,000 to 1,500 vertical meters only, depending on if you go up the left or right side. Furthermore it looked not too complicated. Looked like it would be straight forward climbing. The only thing I was worried about was the approach via the wild upper Baltbar Glacier and the upper part of the Northwest Ridge, where I was planning to climb. Lupghar Sar West (7,157 meters) is the obvious pyramide in the the middle. Right, in the background, is Momhil Sar (7,414 meters). Photo: Hansjörg Auer. What information did you have about the mountain before you went? Not too much. Lupghar Sar West was first climbed in 1979 by a German expedition and in the same year also by a Japanese team, both via the beautiful Southwest Ridge approaching from South-Lupghar-Yaz Glacier (former Garesha Glacier). The Japanese team also climbed the central summit during that time. The east summit was reportedly first climbed during an unauthorized expedition in 1980. The only expedition approaching via the Baltbar Glacier was a French team in 2000. One of the members climbed Lupghar Sar II, a lower peak northwest of Lupghar Sar West. Your expedition nearly got ruined before it really started though right? Something about one of the barrels of supplies rolling over a cliff during the approach? In all my years of expedition climbing I was always thinking that this will happen sooner or later. On a solo expedition it’s maybe the worst moment, because you have fewer possibilities when missing equipment. Luckily the drum that got away was not the one with the most important items, and luckily only the drum fell down and not the porter—he was safe. The approach to Basecamp was pretty steep, with no real path. It was very hard work for the porters. They did an amazing job. So clearly you had porters. 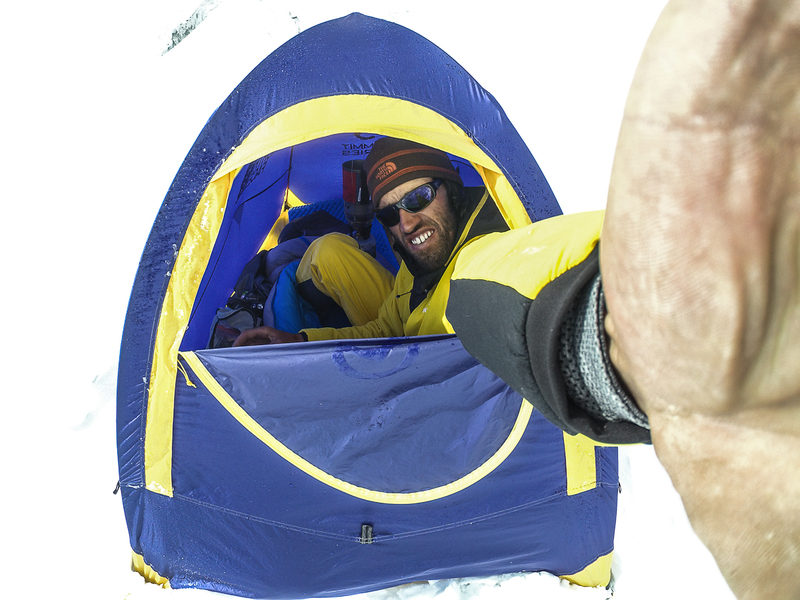 What kind of help did you have getting to Base Camp and throughout the expedition? Usual stuff like porters, cook and guide. Finding the porters was a bit tricky like always in Hunza. For the first time in my career I also had a sat modem with me in Base Camp, which turned out to be a good idea. When solo, you can’t really share moments with your friends, so sending some pics home was somehow nice and also it felt a bit easier for my girlfriend. But I used this only to send info; I wanted to stay super focused and I really was. Can you talk about the climb itself? 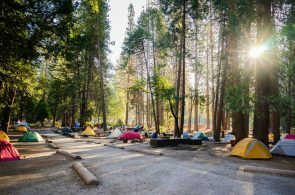 Did you do it in a day or bivy? I did the climb in a two days round trip from Base Camp (4,500 meters), which was pretty cool, with one bivy at around 6,200 meters. Actually, I planned for two bivies, but then I decided to push to the top on day two and leave all my gear at around 6,900 meters. The climbing itself was not too hard. I would say 50° to 55° ice and M3/M4 on the ridge. 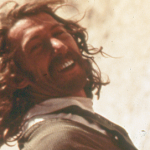 The face itself was less technical than the ridge, where the rock quality was really bad. The two other expeditions in 1979 had also reported very bad rock quality on this mountain. Bivy at around 6,200 meters. Photo: Hansjörg Auer. What did you take up with you? My climbing rack included a 60-meter 5-millimeter rope, three ice screws, two cams, two stoppers, one bird peak, slings and carabiners. As mentioned I took everything up to 6,900m to the start of climbing the northwest ridge. Then I was climbing without backpack and rope to the top. Half way up the ridge I was sure that it was a big mistake to have left the rope. But in the end everything was fine. I tried to be really focused on the down climb. Arriving on the knife-edge summit ridge was such a moment of relief. moment. 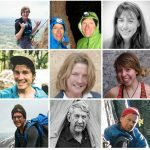 What do you like best about solo climbing? When you’re climbing solo you take more risk, but it feels so great to move light and fast in high altitude on technical terrain. Furthermore you’re much more focused, which results often in better performance. Soloing in high altitude, I had fewer emotions during the climb than I’m used to. And I was fading out psychologically hard moments and doubts much easier. Maybe because the focus on getting to the top was stronger. 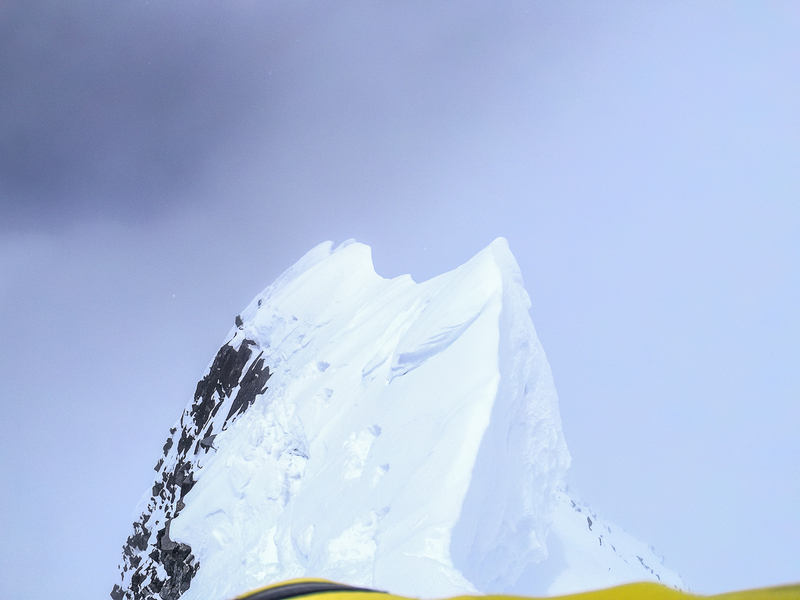 View down at around 7,000 meters on the northwest ridge of Lapghar Sar West. Photo: Hansjörg Auer. You do it all—rock, ice, alpine, solo—is it the same mindset soloing a big mountain as a big face, or different? Good question. I was thinking about that a bit. I think it’s different, because the chance to solo a rock climb appears more often in your life. The chance to solo a high mountain is much more rare. Furthermore how you live the moments on the mountain is very different. Everything feels more focused on performance than emotions. You posted a a video earlier this year of a super sketchy-looking rappel while you were soloing something. Does something like that not give you pause or make you question whether soloing is worth it? The question of if you stop or keep going on is not the main one, because you never want to stop what you love doing. To minimize the risk, the best thing is to keep focused on quality climbs instead of the quantity of climbs. This decreases the probability that something will go wrong. This is what I’ve learned from Simon Anthamatten, who introduced me to climbing higher mountains back in 2013. Do you want to continue to do solo climbs in the Karakoram and Himalaya? If so, what direction do you want to take that discipline? Bigger and higher? More technical and remote? Solo climbing in general is something I never really plan. I always have some ideas in my mind, but whether or not I can realize them is always a question of the moment. We’ll see if such moments—which were necessary for the Lupghar Sar Solo Expedition—arrive in future. But either way, the technical climbing aspect will be always more in my focus on high mountains. After you learned about the accident on Ultar Sar, you said you were ready to go help immediately if they needed. What are the feelings like when you hear about something like that? Since I lost my friend Gerry on Nilgiri Southface in 2015, time always stands still for me in the case of tragedies. I had some missed calls from one of my friends, my girlfriend, from Christian Tromsdorff and also many calls from Iqbal (agency). 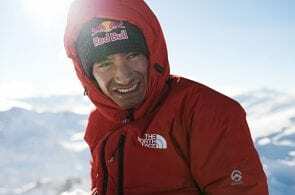 They were worried, because unfortunately it was an Austrian climber who died on Ultar Sar. My guide Javed and I would have been immediately ready to help. But the Pakistan army was already involved, so there no need. This season there have already been many deaths on the mountains of the Karakorum. Let’s hope that everybody stays safe out there. 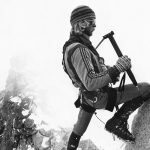 I started to open a new rock climb on Marmolada south face with my buddy Much last year. So this is something I’d like to continue in August. But for now, just coming home and getting back in rock climbing shape.